Domino's Pizza: Is It Really A Turnaround? A few weeks ago, I watched a short four-minute video on Domino's Pizza. According to the clip, customers were disappointed in the product. Some complained the crust tasted like cardboard, the cheese was processed, and the overall taste was nothing to write home about. As with all criticism, one can either get beat up by them or seek to do better. Domino's chose to the latter. In the final minutes of the video, the message was clear. Domino's Pizza spent considerable effort to rebuild the perfect pizza. Pizza chefs supposedly sat around the oven creating a better tasting sauce, flavorful crust, with high quality ingredients. The question I had was, "How does it taste now?" With an opportunity to order out tonight, the family and I decided that we would try the new and improved Domino's pizza. How does it taste? You ask. Read on, I reply. Before I reveal my opinion, let me point out that Domino's Pizza sought to turnaround more than just its food. A visit to the web site shows the company also seeks to rebuild its brand. Remember, this is the company with employees playing around in our food. Needless to say, Domino's has a lot of ground to make up. Going through the process of ordering online, I found the site to be clean with an organized user interface. At first glance, there was nothing new to see. That was until I finished my order. Immediately following the check out process. The site took me to a tracking device. 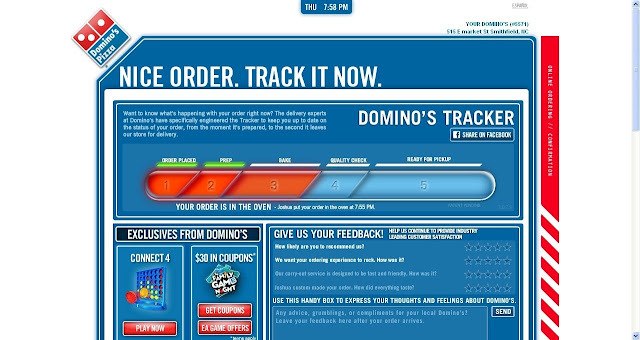 The web-based application, colored in vivid blue and red, displayed five steps: 1) Order Placed, 2) Prep, 3) Bake, 4) Quality Check, and 5) Ready for Pickup. My first impression of the site was extremely positive. Instead of ordering and walking away, I stayed and watched my pizza go through each stage. 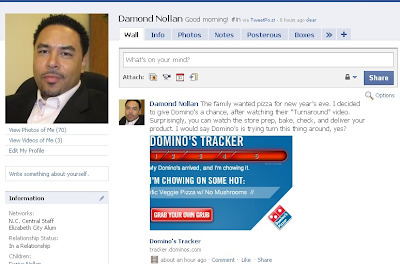 As an added bonus, I also shared my excitement for a Domino's Pizza with friends on Facebook. With the push of a button, I was able to show my friends the process as well. Neat-O! Upon completion, the pizza tracker alerted me that it was ready for pickup. I'm not sure what would happen if I got it delivered, but living out here in the boonies doesn't allow for such a luxury. I digress. Because I knew the maker of my pizza, I asked for him by name. Not sure if this is a question they get often, but the employees didn't seem surprised. Unfortunately, Joshua, the cook/delivery guy, was not available when I arrived, but at least he knows I'm watching. In the car, I opened the pizza box and took a solid bite of my thin crust Pacific Veggie Pizza. As expected, it was hot and quite tasty. At home, I asked the family what they thought about the pizzas and everyone seemed to enjoy it. Truthfully, it has been years since I can remember choosing Domino's Pizza as my number one choice. Today, with real cheese, fresh ingredients, a tasty garlic butter crust, and a bold sauce, I would definitely order from Domino's again. In fact, I would place their veggie pizza up against some of the finer Italian restaurants. Overall, Domino's Pizza has done a very good thing. The leadership should be applauded for taking the criticism of its customers and making a better pizza. As one who plays on the web all day, I also give kudo points to the web development team that made such a cool gadget that incorporates the use of social media. Will the pizza and quality of service remain beyond Domino's media blitz? I don't know, but after climbing a huge hill of adversity, it wouldn't be a wise move. I would love to hear your thoughts on the subject. Have you tried Domino's new pizza? If so, what do you think about it? If you ordered online, what do you think about the Pizza Tracker? 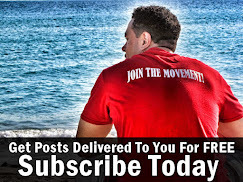 If you like what you've read, take this opportunity to subscribe to my RSS Feed, Newsletter, and E-mail List. 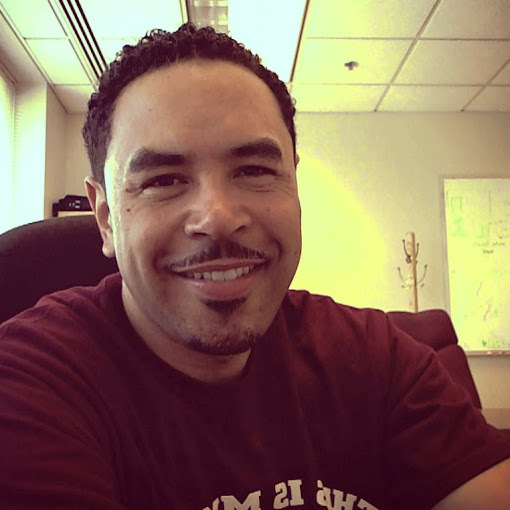 However, don't forget to connect with me on Twitter, Facebook, LinkedIn, Google Reader, or Friendfeed.